And so the Music Hall was first created in 2005, which was a combination of the vision and creative atmosphere of Valerio Berkovics for the decor and Guillaume who was the former private chef for Pierre Cardin and Baron Rothschild. 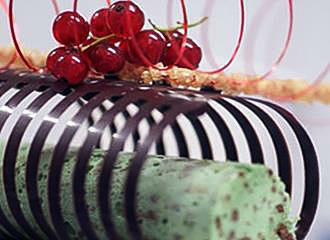 But since then another young chef by the name of Herve Nepple has taken over the creation of the gourmet cuisine. Anyway, getting back to the place itself, this is actually a completely unique venue within the whole of Europe, as it has 600 projectors with 16 million colours programmed by computer, so that the mood changes as the lighting changes to create a soothing and unusual ambience for all to enjoy. From the early morning light, to the glitter of an evening, this is a pre-programmed continous lighting show, where the lights are integrated into the ceiling and the walls, plus there are diamond-shaped strobes that play contrasting effects with the exotic wood panelling around the place. In the lounge, garlands mark out the space to weave a more intimate atmosphere for a romantic dinner or an exquisite meal, and even doctors have commented that it is soothing and calming for an even better mood whilst eating out at this restaurant in Paris with friends or family. This is of course a trendy place that the press just cannot stop talking about, and even if you do not want to have a meal here, there is also a musical bar, known as the piano bar, where you can sip a cocktail, whilst listening to a pianist or a DJ for soothing and soul music. Or perhaps you would like to experience the gentle rhythmic sounds after you have enjoyed your gourmet meal and the restaurant musical bar is the ideal setting from 11pm of an evening. 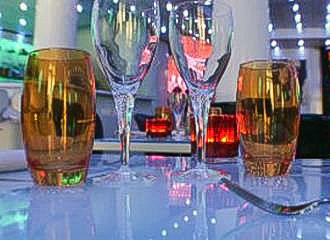 However, there is also late night dining available at The Music Hall until early hours of the morning from late night snacks through to a complete meal and is ideal for those of you that want to see the nightlife in Paris close to the most famous avenue in the world, the Champs Elysees. The Music Hall restaurant in Paris only uses certified products from the best suppliers, so as to preserve the original flavours to enhance the exquisite cuisine and tantalise your taste buds. In addition to this, sugar and salt are barely used in any of their French recipes, plus they only use chocolate from the famous Valrhona chocolate company who have been producing fine chocolate in France for the top hotels and gourmet shops since the year 1922. Now when it comes the cuisine, this is a true gastronomic restaurant with an exceptional a la carte menu that not only combines fine ingredients with traditional French dishes, but also flair, incredible innovation and beautiful presentation, that makes the experience even more inviting. The menu does of course change throughout the seasons, but we will try and give you an idea on some of the incredible fusion dishes you could experience. So for starters you could have the famous Music Hall sauteed frogs, snails and shitake mushrooms, tuna carpaccio marinated with olive oil and a wasabi mousseline sauce, a cream of seasonal vegetables soup or Alaskan King crab with guacamole and fresh goats cheese macaroon. 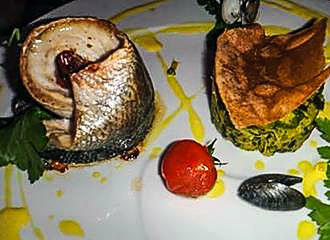 Main fish courses could be delights such as Norwegian salmon with a Champagne sauce and Brittany garnish, sauteed Canadian lobster with chanterelles or Monkfish with potatoes, glazed pears, teriyaki and crystallized shallots. 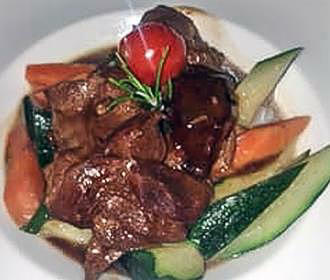 However, if you prefer a meat course, then you may experience chicken supreme cooked with honey and lime with old fashioned mashed potatoes, beffe marinated with a Foie Gras sauce fried chestnuts and celery puree or duck breast roasted with orange along with ratatouille and a polenta baguette with parmesan. The desserts all have their own name and are just as tempting, if not more so than the rest of the infusion gourmet French cuisine. And one such dessert is called the Fraicheur Menthe which is a roll with chocolate chips in a ream of intense mint on dark chocolate, whereas another called the Baccarat is fresh pineapple in a brunoise flavoured with bourbon vanilla seed, ice cream and fine meringues. But these are just a few dishes you may be able to experience at the Music Hall, however, as we mentioned earlier, this is as a general guide, because the menu does change according to seasons and what produce is available, not forgetting the creativity of the chef for introducing other delights to tempt the taste buds! And to give you a rough idea of the costs, the lunch menu at the Music Hall is €18 and this is available from a Monday to Friday, yet the a la carte dinner options, which are available each day are from around €40 up to €65 not including drinks. Every Monday evening from 11pm the Music Hall welcomes you to come and enjoy the very best lyrics of soul, jazz and gospel for an evening rich in rhythm and emotion, whereas on a Tuesday, the evening is dedicated to magic with close up magic and some top artists for fun and relaxation. However, on a Wednesday this is an evening for Zen with astrology, Asiatic massages and much more, but there are also other young talents on other evenings and from time to time they hold what they call Open Scene, which is where up and coming musicians and singers will share their talents. But if you are thinking about the entertainment as well as the French food, then you can also check the agenda, as of course this does change. This was located on the Avenue Franklin D Roosevelt, which is just off the Champs Elysees in the 8th Arrondissement of Paris, and the Music Hall used to be open every day of the week from 11am through to 4am in the morning, however, as we mentioned earlier, this is now PERMANENTLY CLOSED. 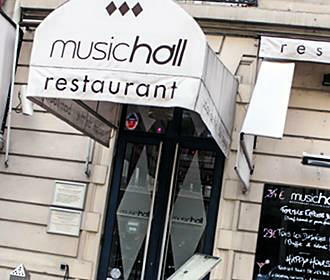 If you wanted to enjoy a good atmosphere, exquisite gastronomic French cuisine, but in a unique and trendy place, then The Music Hall will definitely have been on your list for one of the restaurants in Paris that you wish to experience, but unfortunately this has NOW CLOSED. 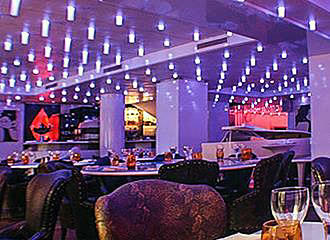 The actor, singer, DJ and show leader Valerio Berkovics, already owned the Carrousel de Paris from 1995, which is one of the cabarets in Paris, but with his love of shows business, glitz and glamour along with gourmet French cuisine, he decided that he wanted to create a place that combined the best of both worlds. The Music Hall was not designed to be a dinner spectacle or one of the cabaret venues in Paris, because Valerio wanted a trendy and upmarket restaurant with quality French food, yet in a unique atmosphere where people could still enjoy different entertainment at certain times.